Today it’s the first day back to school after Spring Break. I’d say the girls have a wee bit of the back to school blues. Not that we went on some sunny vacation or anything, but they enjoyed their break and didn’t want to get up this morning. Lots of moans and grumbles even though I surprised them with a little strawberry smoothie to help brighten their day. I’m ready to get back to our routine and eating a little better. Man, we know how to pack in the junk food while we are on break – brownie sundaes, fast food, big ole burgers, dinners out, chips and queso dip, you name it, we probably ate it! So this week I’m going to try to get back at tracking and caring about what I eat. Once I get going, I really don’t have any issues with being active and working out, my struggle is the eating part. And it’s the part that’s so important. I can undo any great workout so easily and not even realize it. Obviously I love food. I love cooking, and if you’ve checked out my recipes, they are definitely not always the healthiest, that’s for sure. I just can’t do fake or diet tasting food. Nope, just can’t do it. I’d rather go without, rather sacrifice in another area in order to have the item I want, or find a way to try to make the dish a little healthier. 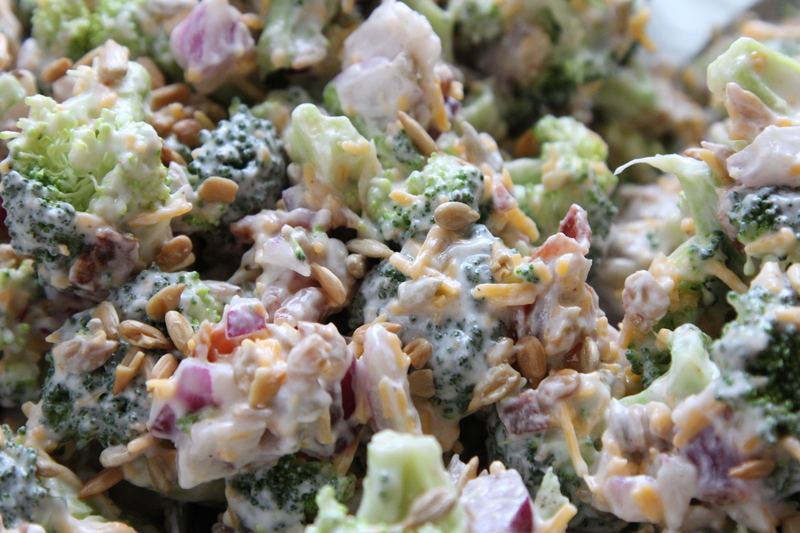 I like a good broccoli salad, but even though it has broccoli, I know it’s not always the healthiest salad. 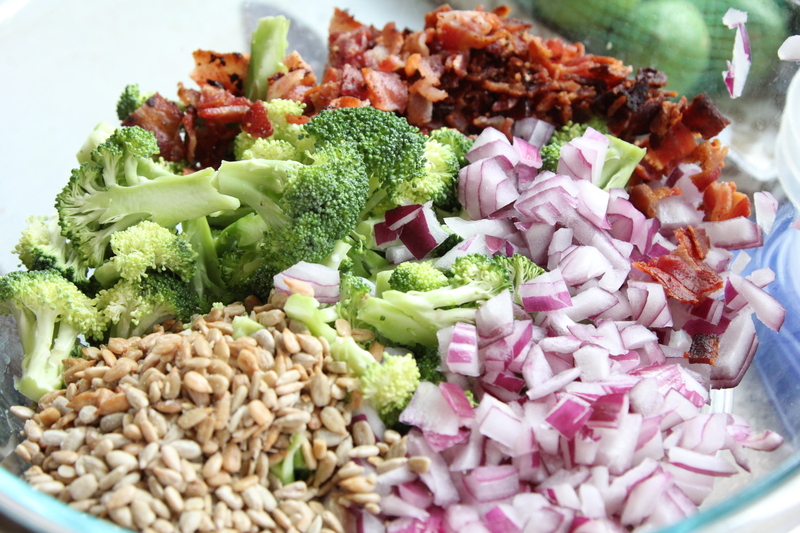 So, I’ve tried to make a few changes to the standard broccoli salad to improve the healthiness factor, without sacrificing one bit of the taste. 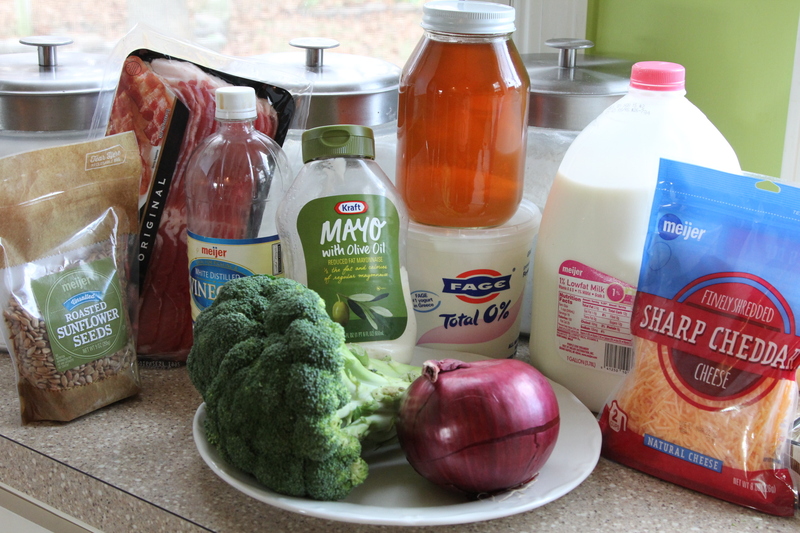 Here’s the basics for the salad. Start by cooking up your bacon. If you wanted to really make this healthier, you could use turkey bacon. I stuck with pork bacon, but a smaller amount and drained it well. Chop the onion and crumble the cooked bacon. I love the colors in this salad. And it’s done. Cover and refrigerate until ready to serve. Can be made a day in advance. Keeps for a few days, before the broccoli begins to lose its crunch. 1/2 C sunflower seeds – shelled. I used unsalted. 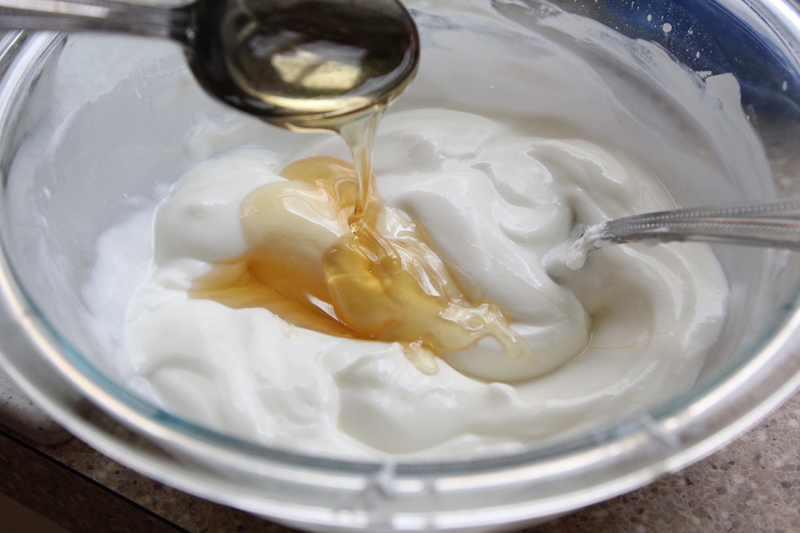 3/4 C plain Greek Yogurt. I used non fat. Optional – Raisins or halved seedless grapes could be added in if you like. Cook bacon and drain and set aside. 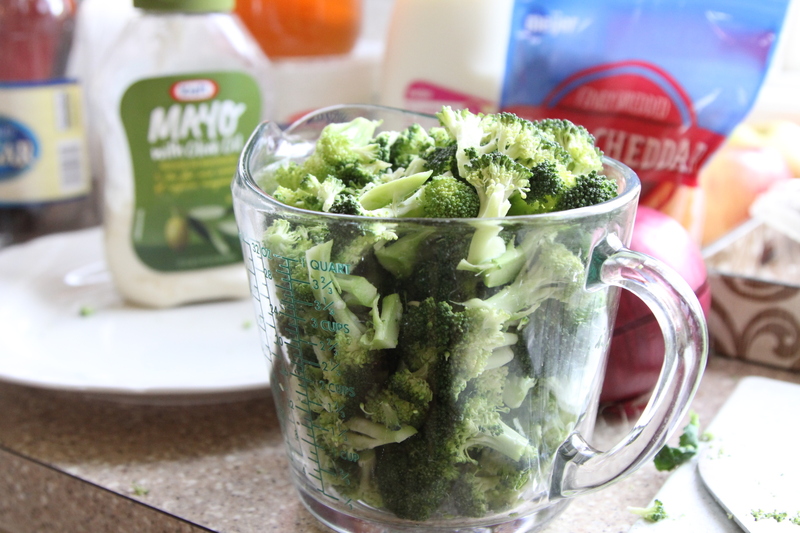 Rinse and chop the broccoli and add to a large bowl. Dice up onion, add to bowl with broccoli. Add in sunflower seeds, raisins, grapes if using. 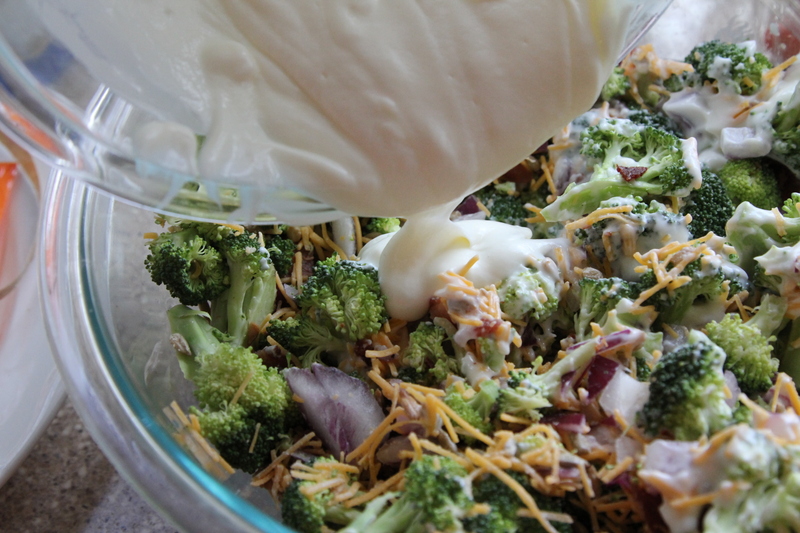 In a separate bowl, combine, vinegar, greek yogurt, mayonnaise, honey, milk and stir to make dressing. Pour dressing over top of salad and stir to combine. Can be made a day in advance and keeps for a few days in the fridge.